TOPPDOGG has finally released their first full album since their debut 3 years ago, and Kpopmap brings you the 12 things you need to know about their “FIRST STREET”. TOPPDOGG hosted the showcase for their 1st full-length album, “FIRST STREET” on November 7, 2016 at the IlChi Art Hall in Seoul. The newly formed 9 member hip hop group performed their title track, “Rainy Day” and other tracks off their new albums called ‘SUNSHINE’ and ‘GOOD MORNING’. The boys also opened up for a detailed Q&A time about their showcase, as well as a fun photo session. In order to celebrate the return of the TOPPDOGG, we bring you the 12 things that can only be found at their “FIRST STREET” showcase! Brought to you by your friends at Kpopmap. The TOPPDOGG boys opened up their “FIRST STREET” showcase with a special performance of ‘Sunshine’. The adorable love song was utterly creative with a musical-like performance. The sweet lyrics were completed by a lovely choreography that was cute, as well as manly with the signature TOPPDOGG style. The highlight dance point you should look forward to? The boys’ seductive hip grind and B-JOO’s brave drop down from a chair! Let’s hope no accident happens to the idol while the boys promote the song. HanSol of TOPPDOGG is officially on board the trendy pink hair train! The idol donned a new pink hairstyle for their new comeback, and it was absolutely mesmerizing. He may be on the later side to get on with the trend, but HanSol brought his own take to the hair trend by making his hair brighter with little peek-a-boo parts of blonde. With his beautiful visuals and now a complimentary pink hair – we think HanSol will be gaining more fans for the group than ever! Their 2nd performance track, ‘Good Morning’ was composed by Yano with the help of A-Tom. The song tells a story about two lovers who are ‘some-ing’, which refers to two people who are attracted to each other, but are not officially dating yet. The boys start off by dedicating the song to their one and only beloved ‘somes’ – their ToppKlass! With their heartwarming lyrics, TOPPDOGG’s ‘Good Morning’ makes us wish that our boyfriends were as sweet as them! The boys first started off the showcase in lovely pastel pinks. Their soft, boyfriend-like outfits were best fit for their two first love songs that were bright with honeymoon love. As the boys came out for their interview session, the boys surprised us with a total outfit change! TOPPDOGG walked out confidently onto the stage dressed in a darker set of outfits. With neutral shades of gray and black with hints of white, the boys turned into manly Fall men for the 2nd half of their showcase. TOPPDOGG’s first full length album is titled, “FIRST STREET”. The boys titled their album with two deep meanings. Their album is the first street that they will walk as their first full length album. It also has the meaning of the street that they have walked together so far over the 3 years. To make matters even more special, many of the album’s songs are credited with the members’ names as composers or lyricists. Yano and A-Tom were especially busy in helping with the production side of their new album. With a year of break since their last comeback, the boys finally returned with an album jammed packed with 10 songs that are full of each members’ take on music. The boys looked back on their year break, where they faced an array of various obstacles. P-Goon actually told the crowd that they were supposed to make their comeback in May, but their comeback was pushed back for 6 months. Through the year they had also faced a few member changes. Kidoh left with quite a bang, but the members still talk with the past member, as they cheer each other on as fellow musicians. Jenissi was also missing from their new album. The members explained that Jenissi is still a member of TOPPDOGG, but has been focusing more on his solo album. Yano beautifully explained that TOPPDOGG wasn’t 10 – 1, but 9 + 1. Not only are TOPPDOGG interested in music, but the idols are also trying their hands at acting! The three idols, Xero, B-Joo and SangDo have been taking acting classes together under HUNUS Entertainment. Although the boys have yet to land their major roles, they told us of their hopeful roles. B-Joo told us that he wishes to try his hand at a humorous character, like Lee KwangSoo’s character from “High Kick”. Xero wants to try a serious role, like Lee JongSeok’s character in “W”. He also expressed how he wishes to act alongside the beautiful actress Han HyoJoo. With their new album, the boys came back with a new set of goals. P-Goon expressed how he hopes to achieve the goal of 10 million views for their music video on YouTube. He explained that gaining that much of views means that their music was well loved by their fans and the public, which is all that he hopes for through this new album. If they do reach their goal, P-Goon vowed to fulfill a promise of safely guiding their fans back to each fans’ house – talk about boyfriend material! During their interview session, the boys showcased each of their charm appeals. From HanSol’s beautician techniques to SangDo’s extremely flexible fingers, the boys were hilarious as they each boasted their individual charms. As each member stood up to showcase their appeal, the rest of the members would laugh at one another in embarrassment. With such humorous and playful relationships, TOPP DOGG proved just how much they have fun with each other as brothers. I think we can look forward to a reality show coming their way soon, don’t you think? 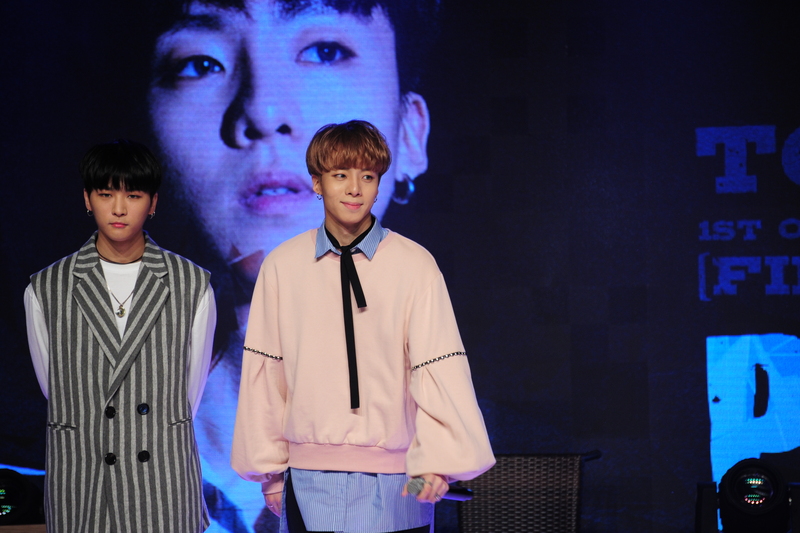 One thing that caught our attention throughout the showcase was P-Goon’s impressive speaking skills. The leader took on each question to answer it to the fullest laced with amusing details. Even when faced with difficult and challenging questions, he didn’t falter as he looked back on the negativity and answered our curiosities with positive responses. P-Goon definitely fits well into the Lee Teuk-like leadership qualities! Instead of their powerful and fierce hip hop style, the TOPPDOGG returned with a softer, autumn-boyfriend feel with ‘Rainy Day’. The title track was composed by ZAYDRO and RHEAT, with lyrics assisted by Yano and A-Tom. Although the song may be talking about a lost love, the boys don’t lose their signature choreography styles as they fill each beat with spectacularly powerful moves. With perfect Kalgunmu execution, we believe ToppKlass will be very satisfied with their oppas’ new title track! As the TOPPDOGGs officially launch their new album, the boys ask for much love and attention. Over the year they have prepared through extensive practice periods to perfect their special album. As the group’s first ever full length album, the boys promise to fulfill their promotional period to the best of their ability. NakTa closed off the showcase by expressing how he wishes to give back to their ToppKlass with more love, sweat and tears. 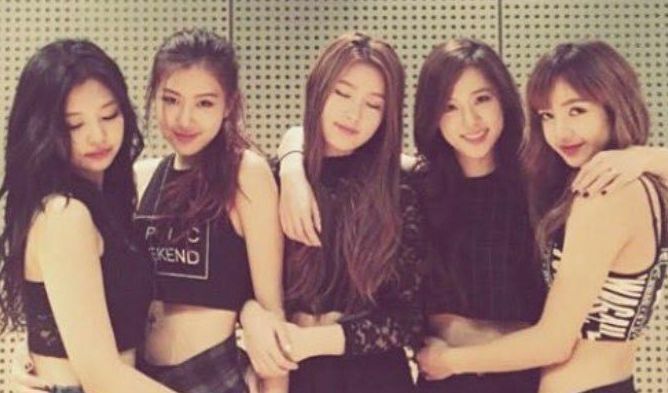 The year-long wait for both the idols and their fans seems to have paid off in the end!